HOLKER (UPPER), a township in Cartmel parish, Lancashire; containing the chief part of Cartmel town; containing also Beckside hamlet; and extending northward to the river Leven. Acres, 6, 550. Real property, £5,726; of which £65 are in fisheries. Pop. in 1851, 1,134; in 1861, 1,035. Houses, 199. The decrease of pop. was caused by diminished employment in a reconstructed cotton mill, which required fewer hands than a previous one destroyed by fire. The manor belongs to the Duke of Devonshire. Gunpowder mills are at Low Wood. A charitable fund in this township arose from the purchase of five acres of land with 185½ guineas, found in the pocket of a travelling beggar, who died in a lodging house here in 1799. Details about the census records, and indexes for Upper Holker. You can also perform a more selective search for churches in the Upper Holker area or see them printed on a map. The Register Office covering the Upper Holker area is Ulverston. Ask for a calculation of the distance from Upper Holker to another place. In 1835 Upper Holker was a township in the parish of Cartmel. 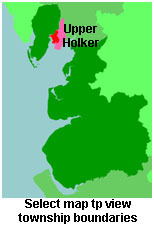 You can see the administrative areas in which Upper Holker has been placed at times in the past. Select one to see a link to a map of that particular area. View maps of Upper Holker and places within its boundaries. For probate purposes prior to 1858, Upper Holker was in the Archdeaconry of Richmond, in the Diocese of Chester. The original Lancashire wills for the Archdeaconry of Richmond are held at the Lancashire Record Office.